For many years the tufted cushions have reigned as the cushion of choice for casual furniture. Tufted cushions are typically more economical then most other types and provide the amount of comfort desired for casual seating. Tufted cushions are made from three basic materials. Thread, fabric and filler. A template is used to cut the shape of the top and bottom panels for a particular sized cushion. Cushions budge when filled, so its important to use the correct size pattern to obtain the right size and cushion thickness when filled and complete. The panels are sewn together inside out in order to have a tight seam with very little thread showing on the outside. About a four inches section along the outer seam is left open to fill the cushion. Once the panels are sewn together, the cover is turned right side out. Sewn circles called tufts are then sewn in the desired pattern between the panels. In a typical 19 inch chair seat, one or four tufts are added. This completes the basic cushion cover. In commercial operation, fiber fill is blown in by a machine using a pipe like extension that reattaches deep in to the cushion cover between the tufts. The skills of the operator that fills the cushions will determine the shape and consistency of the final product. Soft cushions have fewer tufts where as firm cushions have more tufts. However, the amount of fill forced into the cover will regulate the firmness. The tufts play an important role in the cushion design by keeping the fabric in place and not shifting. Finally, once the cushion is filled, a sewer hand sews the four inch seam where the fill was blown in and the cushion is complete. In some cases, piping and buttons are added to improve the elegance of the cushions, but these do not typically change the comfort. Tufted cushions are typically used for casual furniture. 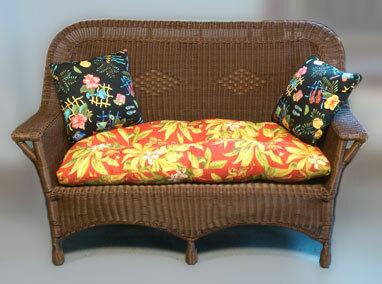 They are typically found on wicker furniture, teak and metal outdoor furniture that do not require back cushions. Seat cushions are crafted to fit the shape of the seat. The tufting not only plays an important role in keeping the fill inside the cushion from shifting, it plays an important role in the appearance of the cushion. Unlike flat cushions, tufted cushions have character that adds to their desirability to improve your decor. Tufted cushions are also forgiving as compared to firm foam cushions. If foam cushions are not properly sized and contoured to fit the curves of the furniture, they may not look very good. This can be an expensive mistake. Tufted cushions on the other hand are expected to fit generically and their style is very desirable to observe. Tufted back cushions are popular on deep seating casual furniture. Deep seating furniture usually have solid foam seat cushions and a filled back cushion. A back cushion that is tufted adds a certain character to a chair, sofa or love seat that it would otherwise not have unless they were tufted. The tufted cushion is one of the most popular cushions made because its design is simple and relatively inexpensive. It can be used for seat and back cushions to provide comfort as well as an enhancement to your decor.